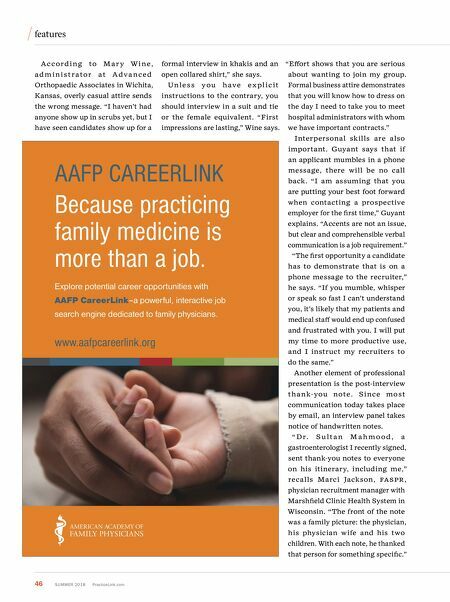 46 S UMMER 2018 PracticeLink.com features Explore potential career opportunities with AAFP CareerLink –a powerful, interactive job search engine dedicated to family physicians. Because practicing family medicine is more than a job. AAFP CAREERLINK www.aafpcareerlink.org A c c o r d i n g to M a r y W i n e , a d m i n i s t r a t o r a t A d v a n c e d Orthopaedic Associates in Wichita, Kansas, overly casual attire sends the wrong message. "I haven't had anyone show up in scrubs yet, but I have seen candidates show up for a formal interview in khakis and an open collared shirt," she says. U n l e s s y o u h a v e e x p l i c i t instructions to the contrary, you should interview in a suit and tie or the female equivalent. "First impressions are lasting," Wine says. "Effort shows that you are serious about wanting to join my group. Formal business attire demonstrates that you will know how to dress on the day I need to take you to meet hospital administrators with whom we have important contracts." Interpersonal skills are also important. Guyant says that if an applicant mumbles in a phone message, there will be no call back. "I am assuming that you are putting your best foot forward when contacting a prospective employer for the first time," Guyant explains. "Accents are not an issue, but clear and comprehensible verbal communication is a job requirement." "The first opportunity a candidate has to demonstrate that is on a phone message to the recruiter," he says. "If you mumble, whisper or speak so fast I can't understand you, it's likely that my patients and medical staff would end up confused and frustrated with you. I will put my time to more productive use, and I instruct my recruiters to do the same." Another element of professional presentation is the post-interview t h a n k-you note. Si nce most communication today takes place by email, an interview panel takes notice of handwritten notes. " 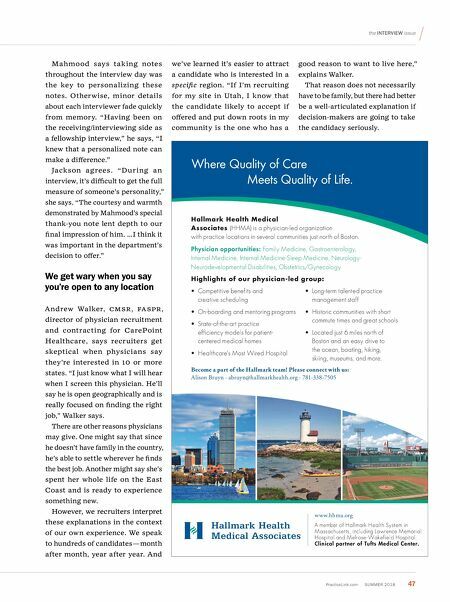 D r. S u l t a n M a h m o o d , a gastroenterologist I recently signed, sent thank-you notes to everyone on his itinerary, including me," recalls Marci Jackson, FA SPR , physician recruitment manager with Marshfield Clinic Health System in Wisconsin. "The front of the note was a family picture: the physician, his physician wife and his two children. With each note, he thanked that person for something specific."